In theory in a democracy, informed voters elect their representatives according to rational criteria. After gathering all the information they need, they opt for the politicians they believe are best suited to carry out their duties in the interests of the population. In reality, many vote for politicians like Marine Le Pen, who use populist slogans to affect people emotionally, so that they cast their ballot according to gut feeling instead of using their heads. Hitler would never have won an election otherwise. But let’s focus on the phenomenon of Marine Le Pen, whose aim is to make right-wing radicalism in France socially acceptable. Marine Le Pen carries on the ideas of her father, in her own way – and far more successfully. She is smarter than he, which isn’t hard, and more charming, a grande dame, blonde and attractive. It is only “a detail of history” that the father is no longer proud of his daughter. 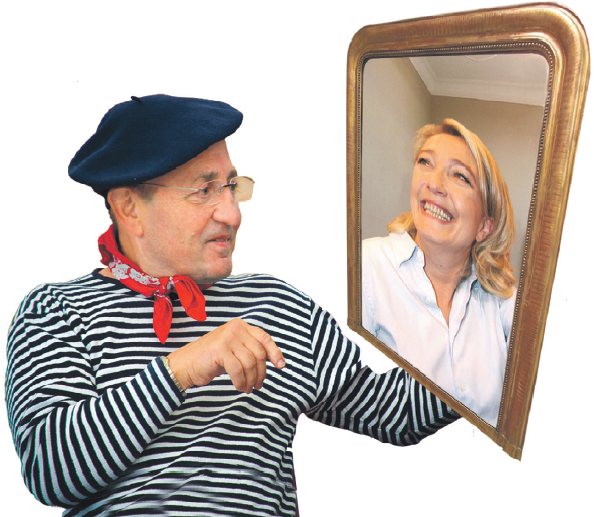 He sabotages her work, and she has banished him from the Front National’s official website, because she no longer believes he’s controllable – but not in every respect. She still uses many of his methods, and certainly for the same purposes. He could recognize that, but there is no place for the slightest subtlety in his all-or-nothing, either-or agenda. He now only refers to Marine as “madame,” the two have broken off contact. That’s no unique occurrence in the family. Marine’s older sister was thrown out of the family home, before the eyes of the media, because she refused to be obedient. The daughters grew up in this environment, spurred on by a thirst for recognition – from those who always dangle the carrot just out of reach and say, yes, you do it almost as well as I do. Blood is thicker than water, the proverb says. It refers to the majority, but not to a small group of fighters who regard even family members purely according to their usefulness. Not everyone can manage that, because people are always absorbing things like emotions, sympathy and values. But some turn their backs when the admiration is not reciprocated, saying, “they’re all rotten.” Nothing is as it used to be. The paint is scratched, the shine, the grandeur – all fallen victim to this reality that, to add insult to injury, has taken the form of one’s own daughter. The father cultivated anti-Semitic clichés. Marine has discovered a scapegoat: Les Gitans. Someone must be to blame when greatness crumbles, when doubts nag whether the new paths one has pointed out have become dead ends, maybe ever since Waterloo. For all inclined to pinpoint responsibility, there is much to analyze and a great distance to look back. The ongoing Waterloo is complex. It’s navel gazing, and quite an effort. “I am treated in an undignified way. This conduct hurts me, especially since I think I am completely free of blame,” Jean-Marie Le Pen is quoted as once having said. How could one better illustrate a narcissistic disorder? Failing to recognize the special circumstance, incorrectly answering the question of guilt. Self-reflection is nothing for people who, when push comes to shove, cut blood ties to avoid having to take responsibility for their own conduct. Casting blame is far easier to communicate. At least a quarter of all French feel better understood that way. This is Marine’s home. She reduces complexity to the level of guilt, thereby avoiding the question of responsibility. No one would have to take any of this seriously were not the whole Grande Nation fearful of being removed from the website. Marine knows that a part of France comes to grips more easily with the country’s troubles when scapegoats are provided who come from outside: Sinti, Roma, corrupt politicians, globalization. And she has succeeded in bringing France to regard the vanishingly small number of Roma families as one of France’s greatest problems ever. Her position is as clear and easy to understand as the world and its events are not. She whips up hatred and debases others at a primitive level of self-defense. Debasing others is the flip side of idealizing all those who recognize her grandiosity. There exists a suspicion among the people. Half of all French have signaled that they want their country protected from globalization, which they regard as a threat. It’s all enemies, all loss of control, change, insecurity whether the old ways still work. The distrust would be resolvable only if one were to give the people images and show them that this openness would be the foundation for future growth. But Marine gives them balsam instead of strategies. Les Français d’abord. The French come first. That is the idea that at least a quarter of all French citizens agree on. Slogans divert attention from policy. It’s the same with guilt: You’re the enemy. I’m good. Responsibility is digi-tal. And this digital reference brings us back to the open systems, in which people swarm like locusts over their own grandiosity. Danger! Too bad it didn’t work out with the World Cup. But it’s good that the police interrogated Sarkozy and Hollande is delivering catastrophic economic data. They’re all rotten! Tous pourris! That’s also what Marine gives the people, a battle cry in the war for votes. The time is ripe for seduction. La Grande Nation is groping, switching from right to left, and sometimes leaning in extreme directions. It’s likely that this isn’t all being done with conviction. People are disappointed by all the empty promises. This is the milieu in which narcissistically disturbed people get the attention they crave. They are masters of chaos and despair. When others buckle and succumb to disaster, these people rise to the top, with clear slogans and clear accusations. That can only be someone with no mind for responsibility, who spares no time to think about a vision for the country, a vision that could lead the nation out of its crisis. the issues, and catch the masses. They create an artificial charisma. They are loved during these phases – and when they manage to overcome the hurdles of democratic structures. But already in the medium term, as many studies have shown that inquire into pathologies at the leadership level, these kinds of leaders take the group towards ever-deteriorating results, because the seduction, which they’re pretty successful at, is always followed by paralysis and, then, destruction. So far, Marine has been “successful.” She could succeed in steering a narcissistically disturbed country into international isolation,sidelined to such an extent that France, La Grande Nation, can no longer return to its earlier grandeur and is removed from the web page of public debate, openness and reflection. But she probably won’t succeed, because the majority of the French people is begin­n­ing to define limits, recognize dependencies in the global context and stand up to them not with isolation but with their abilities. They are searching for responsibility and practical ways forward, not guilt. In this universe, Marine does not exist. It requires sustainable concepts, a strategy, and empathy.